On Apple's 40th anniversary, Jason Snell marvels at how its products have shaped his life and career. The Apple II captured my attention and started a lifelong connection with Apple products. We had them at school, of course, and my friends and I spent hours of recess and lunch and after school playing Ultima and SSI Computer Baseball and countless other games on the school computers. In early 1984 my parents allowed me to dip into the money they were saving for me to go to college–a bold move since I wasn’t yet in high school!–and buy an Apple IIe. LIFE WITH AN APPLE II+ MEANT THAT LINES WERE SHORT AND LOUD, LIKE A SHOUTING PERSON WITH A BREATHING PROBLEM. I wrote countless BASIC programs on those early computers. But if I’m honest, I have to also admit that I pirated a whole lot of software on those computers. On the Apple II, you didn’t just have two disk drives in order to load up on storage–you had them so you could stick a blank disk in one of them and copy the disk from the other. The computer that launched so many careers. Proving my parents’ investment in my future to not be in vain, I took the Apple IIe with me to college. But in the fall of my sophomore year, I started working at my college newspaper–and using Macs frequently. The fact that both computers were made by Apple was helpful–there was a utility called Apple File Exchange that allowed a Mac to read my Apple II-formatted disks, so I could write things on my Apple II and then transfer them to the Macs at the office. Microsoft Word, Aldus PageMaker, and the networked space-battle game NetTrek were powerful drugs. I started writing my essays at the newspaper office on off hours, because I’d rather write on a Mac SE than my old Apple IIe. The poor thing probably never saw it coming. That spring I bought a Mac SE of my own during a sale at the campus bookstore, and my life as a Mac user began in earnest. I loved that computer. I bought Macworld and MacUser magazines, read Internet newsgroups, downloaded shareware and Apple OS updates (including System 7, which took more than a day and something like 15 disks to download). I marveled when a young MacUser columnist named Andy Ihnatko made a joke about my apartment’s cross street in the Help Folder column, not realizing I’d end up knowing that guy for two decades. In grad school, I got a PowerBook 160 and an internship at MacUser magazine, beginning my career as a technology writer and editor. It’s hard to believe that I have been writing professionally about Apple for more than half of its existence, but the math doesn’t lie–23 years out of 40. 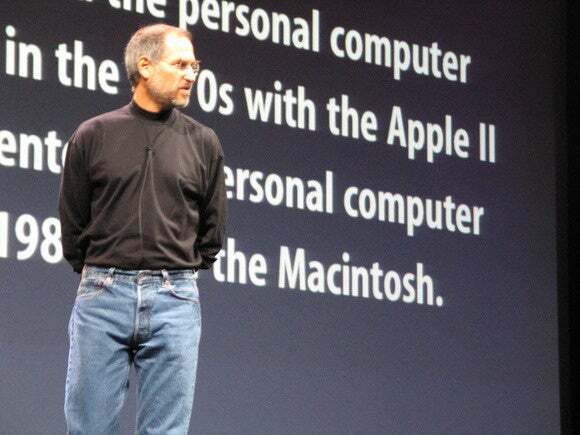 Steve Jobs presents at keynote speech at Macworld Expo in San Francisco on Jan. 6, 2004. But Steve Jobs’s return to Apple changed everything. 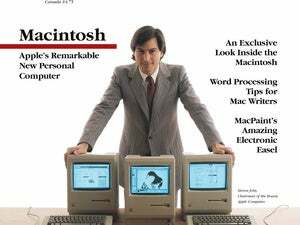 As a new editor at Macworld, I got to witness the company’s near-death experience and emergence firsthand. One of the first feature stories I worked on at Macworld was titled “Save Your Mac,” and was all about finding ways to keep your company’s managers from wrestling your computer away from you. Meanwhile, our company’s CEO plotted the eventual conversion of our magazines to serve designers and other Mac refugees who were going to inevitably be forced to flee to Windows NT. It didn’t happen. Instead, writing about Apple for Macworld became a roller-coaster ride of a different sort. The iMac appeared and Apple had something resembling momentum for the first time in ages. OS X promised to bring Unix power to the Mac and do away with the classic Mac OS, which had served us well for 17 years but couldn’t provide the stable foundation that a modern computer required. And then in 2001, the Apple Store and iPod arrived and changed Apple’s fate forever, though it took a while. The iPod was a product even Windows users wanted to own, and it was such a great product that it began to make people less likely to think of Apple as the maker of weird, incompatible computers and more likely to think of Apple as the creator of fun technology products. A visit to the Apple Store in the local mall would only reinforce this impression. The “halo effect” had begun, and it would boost Mac sales, make the iPod a hit product, and prime the pump for the big story – the iPhone. Future historians, if pressed to give a Hitchhiker’s Guide to the Galaxy-length description of the relevance of Apple, may simply say “the iPhone.” The Mac was so groundbreaking that it deserves a lot of credit, but the iPhone is a product that has transformed Apple. There are many, many people who never used an Apple product before they bought an iPhone. Some of them had iPods before, some of them may have even bought Macs since then. But from the vantage point of nine years out from the iPhone’s debut, it seems like the iPhone in general, and smartphones in particular, will be remembered as a huge milestone in our technological history. 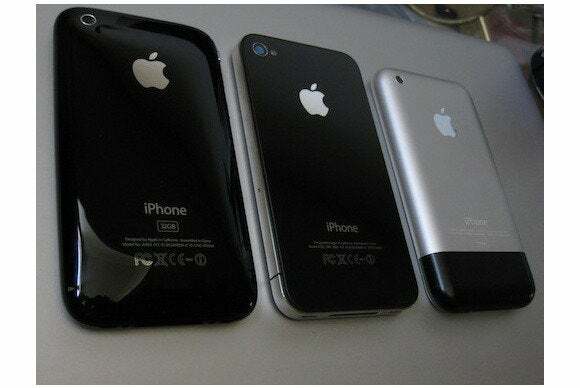 Three generations: The iPhone 3GS (left), iPhone 4 (center) and the original (right). There’s a joke in a 2005 episode of Doctor Who, set in the far future, where a character refers to a giant Wurlitzer Jukebox as an “iPod.” It was funny at the time because the iPod was so ubiquitous it was amusing to think of future generations categorizing all jukeboxes of every kind as “an iPod.” It’s funnier now because the iPod is already fading into memory, eclipsed by the iPhone. Remember the iPod? I type and say “iPad” now when I’m trying to mention the iPod. How quickly things change. But an OS X anniversary seems almost beside the point these days. Whether you’re a believer in the iPad as the future of computing, or just someone observing that smartphones have taken over the world, the tech world just keeps pushing forward. Maybe in a decade we’ll all be talking to a Siri that lives in our ears or floats in the air of our homes or pops up in our vision. But this much seems certain: Apple’s been bringing the future to us all for 40 years, and it shows no signs of stopping. Bring on the next 40.